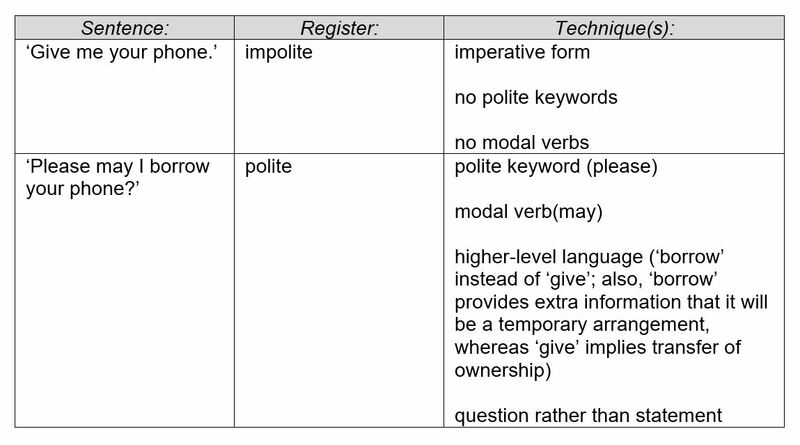 Register describes the way that English native speakers adjust their language to match the specific situation, mood, and audience that applies. 1. T (teacher) cuts out the sentences and mixes them up. T informs SS (students) that the four sentences in each exercise contain the same basic message, but the different register in each adds a hidden meaning that SS can often miss in everyday conversation and writing. Optional: SS could complete a blank table (see below) and do the same with a number of sentences – either their own or ones from this activity. 5. SS compare English with their first language(s). Do they have equivalents for all four sentences in each set? Do they have more ways to say the basic message or fewer? 6. SS study each set of sentences and write down / say what is the basic message in each set. For example, ‘Be quiet’ is the basic message in Set 8, but we may need to apply a stronger register to make the message understood, depending on the given situation / audience / mood. 7. SS choose a random set of four sentences, either their own or from the activity. How many more ways can they think of to say the same basic message? 8. SS choose a random set of four sentences. In what situation / with whom would they use each of the four sentences in a set? Why? What’s the difference? SS state an example situation, audience, and mood. 9. SS try saying the same sentence differently according to the non-linguistic techniques listed on p.8, such as intonation, gesture, relationship, and so on. SS could record themselves speaking in different ways and give them to another pair or group to analyse. SS discuss and then write down what they notice. 10. SS make a list of situations when using the wrong register could be inappropriate or cause problems, for example, using an overly formal register with your close family, or excessive use of discourse markers like ‘You know’ at a job interview. SS could role play some of the situations and/or write dialogues to perform to the rest of the class. 11. 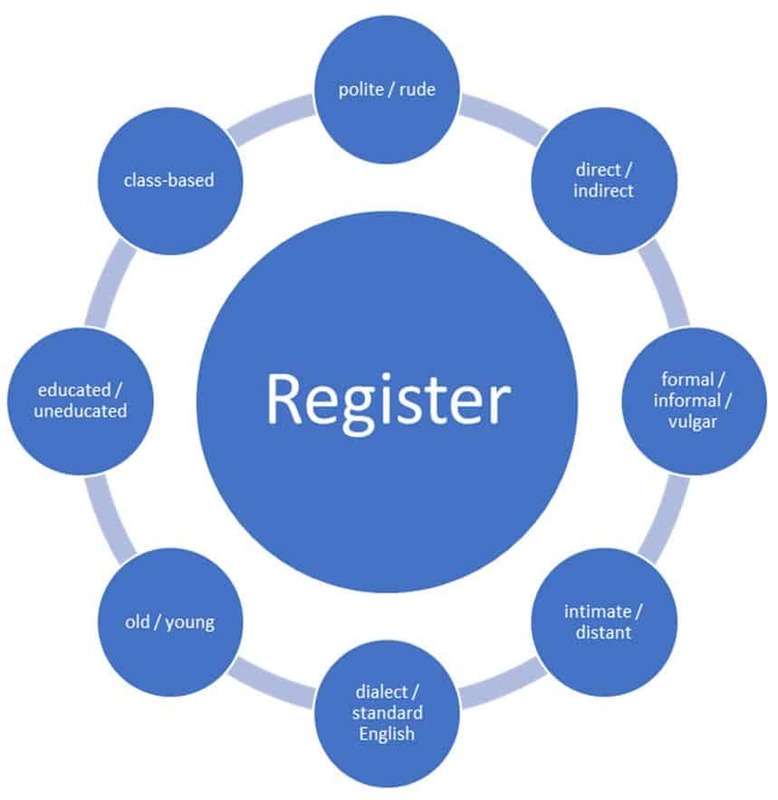 SS discuss people they know and people in the media who tend to use a particular register, e.g. their school secretary may be overly polite, while the director or their teacher might be unnecessarily direct. Why do they talk like this? What effect does it have? How successful is their communication? What do they get from it? What would be the effect if they changed their register? 12. SS may like to try matching the techniques to the registers above. Answers will vary and useful discussion should be generated. 13. T elicits from SS that we can also subvert the conventions. One way would be to use overly polite language in a situation that does not require it to produce effects like sarcasm, irony, and superiority. For example: your friend asks if her new hairstyle looks good and you say: ‘Oh yes, darling, it looks absolutely wonderful!’ But your tone of voice indicates sarcasm. SS could role play this concept with various situations.